The GOLD PRICE dropped only $7.50 (0.63%) $1,176.20 while SILVER dropped 40.5 cents (2.51%) to $15.732. That sent the GOLD/SILVER RATIO to a new high for the move, 74.765 — another argument for a bottom nearby. 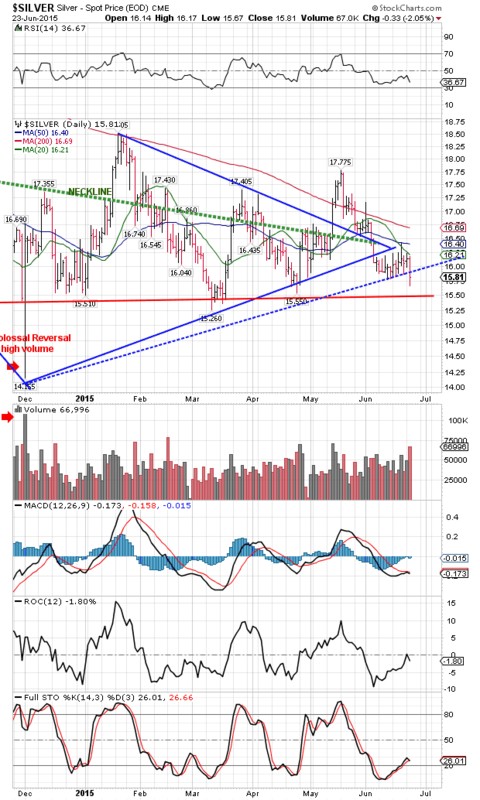 Silver pierced and closed below its uptrend line. Normally that leads to a further fall. Silver has support about $15.50, but that’s not to say it cannot drop further in a quick spike that will scare us all to death. RSI is negative but other indicators are not. Look for yourself, chart on the left. No surprise, the GOLD PRICE sliced through its 20 DMA today, so gravity and momentum are weighing heavily. If it doesn’t stop at that $1,175 area that stopped it before, it is doomed to drop to $1,162, the last low, or $1,140, the March low. The volatility is killing me. The Greek crisis gets blamed for it, but it arises out of markets that are nervous, greedy, scared, and confused. That’s why they dump the dollar for 118 points one day, and buy it for 118 the next, why stocks lose 200 in two days then take back 100. All the unknowns and the fearful suspicions are weighing markets down, especially the suspicion that the Fed just might be stupid or lying about the economy. I would say, Look for a sudden, sharp turnaround as a buy signal, but we’ve had too many of those that have fizzled lately. Exampling how volatile and spooky markets are — thanks to stabilizing central banks — the US dollar index today rose 118 basis points (1.25%) to 95.70. On what news? What changed? Somebody discovered how to make electricity for free in the US? Nope, one Fed Reserve governor named Jerome Powell made a speech claiming the US economy “could” be ready for a rate hike in September, followed by a second in December and the US economy is set to strengthen in the year’s second half. What I don’t grasp: the Fed has NEVER yet, not once, correctly forecast the US economy. Why would anybody believe any of their shills today? Beats me. Dollar began rising last night, and opened today (24 hour day) about 94.80. Then it steadily rose until 9:30 eastern, then flattened the rest of the day. Silver and gold prices pretty much painted the reverse of that. In spite of rumors the Greek crisis is solved, stocks could hardly put one foot in front of the other today. Dow managed to climb 24.29 (0.13%) to 18,144.07. S&P500 added 1.35 (0.06%) to 2,124.20. Volume is not falling but also not growing. Can still inch higher. 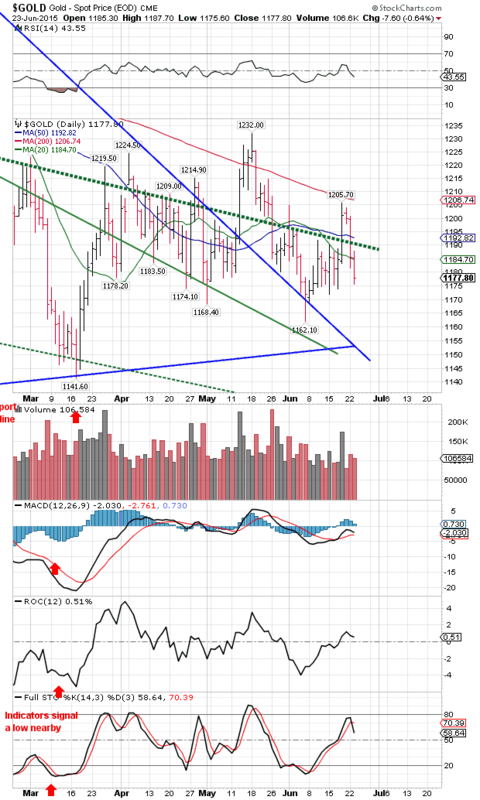 Look at the chart on the right, the Dow in Gold, Today the DiG punched through the upper gator jaw, closing at 15.41 troy oz versus the March high at 15.58. I’ve been warning y’all this might happen. When I saw it, first thought that struck my mind was, “That’s it. We’re seeing the bottom in gold forming now.” Oh, maybe not today, probably not today, but it’s close. 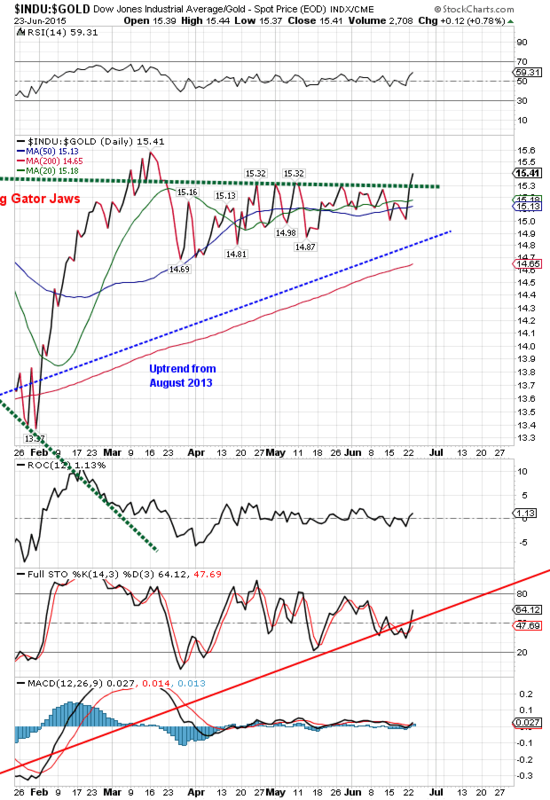 Stocks are making their last push up and the gold price its last dip, sending that Dow in Gold up. Remember, too, that we are now in the seasonal low window for silver and gold prices. Here’s the Dow in Silver on the left, It is reaching for its upper gator jaw, but not quite there at 1,152.96 troy ounces. Same vision applies here. A price bottom is coming for silver, whether now or two weeks, it’s coming.